Pro wrestler Chris Benoit strangled his wife, suffocated his 7-year-old son and placed a Bible next to their bodies before hanging himself with the pulley of a weightlifting machine, authorities said Tuesday. Investigators found prescription anabolic steroids in the house and want to know whether the muscle man was unhinged by the drugs, which can cause paranoia, depression and explosive outbursts known as "roid rage." Benoit's employer, the WWE, instituted a new and supposedly tougher drug policy just last year after the death of another wrestler was linked to steroid use, reports CBS News national correspondent Byron Pitts. Authorities offered no motive for the killings, which were spread out over a weekend, and would not discuss Benoit's motive or state of mind. No suicide note was found. Benoit, a Montreal native whose nickname was "The Canadian Crippler," was known for his wholesome family man image. His wife, Nancy, was a wrestling stage manager who worked under the name "Woman." They met and fell in love when their wrestling story lines intertwined. When he won the world heavyweight championship, Benoit (pronounced ben-WAH) hoisted the belt over his head and invited his wife and child into the ring to celebrate. Nevertheless, Nancy Benoit filed for a divorce in 2003, saying the couple's three-year marriage was irrevocably broken and alleging "cruel treatment." The bodies were found Monday afternoon in three rooms of the house, off a gravel road. Benoit's wife, 43, was killed Friday in an upstairs family room, her feet and wrists were bound and there was blood under her head, indicating a possible struggle, Ballard said. The son, Daniel, was probably killed late Saturday or early Sunday, the body found in his bed, Ballard said. Benoit, 40, apparently killed himself several hours and as long as a day later, Ballard said. His body was found in a downstairs weight room, his body found hanging from the pulley of a piece of exercise equipment. Toxicology test results may not be available for weeks or even months, he said. As for whether steroids played a role in the crime, he said: "We don't know yet. That's one of the things we'll be looking at." The WWE, based in Stamford, Conn., said authorities asked that it not release further information on the deaths. "He was like a family member to me, and everyone in my family is taking it real hard," said fellow Canadian Bret Hart, a five-time champion with the World Wrestling Federation. The federation has since changed its name to World Wrestling Entertainment. 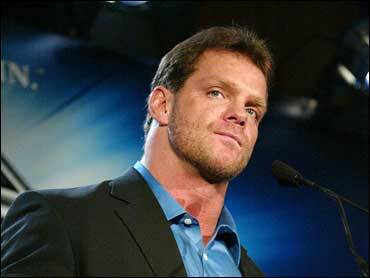 Benoit had maintained a home in Atlanta from the time he wrestled for the defunct World Championship Wrestling. The Fayette County Tax Assessors Office lists the value of the house, on more than 8.5 acres, at nearly $900,000. Benoit had two other children from a prior relationship.